Setting objectives might not be top of the agenda for a photographer, but the reality of making a business work demands consistent and thought-through planning. In amongst the years studying and practising the finer points of photography, the now-second nature elements of setting up a shot, getting the best light and selecting the right exposure do not differ a great deal from getting the fundamental business objectives in place. Once learned, these foundations of good business practice will ensure a much smoother passage in the long run and enable your creative business to operate free of a bureaucratic straight jacket. There is a temptation here to come across very corporate and sound like a middle manager at a large corporation, so we’ll try to avoid that! There is logic to this approach of course and if a grand task like business planning is daunting, then approaching it within this set of guidelines and cutting it into manageable chunks could well be the ticket. Making sure the goals you set are specific, you need to clearly state what you are aiming for. You need to be able to measure how well you are doing, without being able to do this, performance cannot be judged. If you want to grow your profits, by how much, 20%, 50%? How much more commercial work do you want? 10/20/50 more shoots? How can you track your online sales vs. other forms of sales? The objectives need to be agreed with everyone involved. If you have staff in involved, they need to buy in to this otherwise you will fall short. If you want to do more commercial shoots, will this impact on your teams working hours and how will they be remunerated? If you want to grow your business and this will mean more weekend work, have you cleared with your other half? 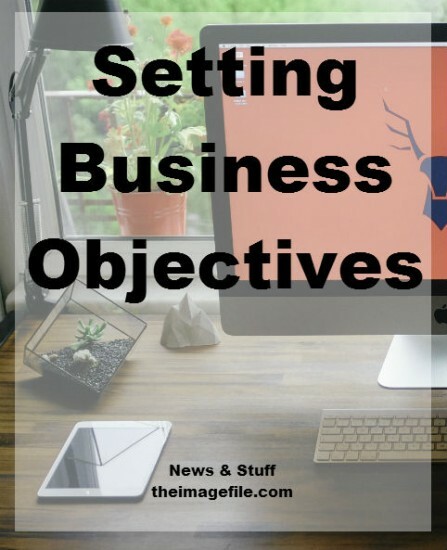 Are your objectives realistic? There is little point in setting them in the first place if they are not as you will quickly become disillusioned and lose focus. Can profits really be increased by 50%. If so, what do you need to do to help facilitate this? Take on more staff, improve processes, invest in hardware, build a new website? Is an additional 50 commercial shoots really possible with the spare capacity you have? So you want to sell images online, have you systems in place to facilitate this? Objectives need to be time-bound. If you want to increase your profits by 20%, over what time period do you wish to achieve this? Over what period do you want to want to secure those 50 commercial shoots? Breaking each objective down into bite sized chunks makes setting them much more manageable. Once you have your objectives in place, revisit them regularly to make sure you remain focused, as this is the course you have set your ship to sail. Of course you can a change them long the way too and they are not set in stone.